Episode 1 : "The Big Parade"
Captain Mainwaring decides the platoon should have a mascot for the forthcoming parade for Spitfire Week, and Private Sponge says they can have one of his rams, if they can catch one. They don't manage to get one, but Wilson ends up on barbed wire and Pike in a bog! Walker gets a goat for the platoon, but it is a very moth-eaten looking thing and they don't bother having one. The parade takes place, but ends up being a race between the platoon and the wardens. Episode 2 : "Don't Forget The Diver"
A large exercise between all the local home guard units is to take place, and the Walmington platoon have to plant a bomb in a windmill occupied by the Eastgate platoon. They eventually manage this by getting Fraser in a diving suit, pushing Jones in a tree disguise down river and then Jones going to the windmill (still disguised as a tree) and throwing the "bomb" through the window. Success! Until Jones manages to get fastened to the windmill sails. Episode 3 : "Boots, Boots, Boots"
Mainwaring introduces the 3 F's, Fast Feet, Functional Feet and Fit Feet and decides to take the platoon on seven mile route marches and running across the pebbled beach. But this fit feet drive hits the final straw when he announces a 20 mile route march. They plan to swap Mainwarings boots for a smaller pair and make his feet hurt as much as theirs and hence stop the 20 mile march, but they didn't account for the shopkeeper returning a pair he had taken in for repair. Episode 4 : "Sgt - Save My Boy!" The platoon take over the Harris Orphans Holiday Home Hut on the beach, but Pikey gets caught in some barbed wire. The platoon try to figure out how to save him from the incoming tide, and have to feel their way across the beach, in case of mines. Meanwhile, Godfrey manages to reach him a different way and saves the day. Episode 5 : "Don't Fence Me In"
The platoon are given the job of guarding the Italian prisoners of war, but Mainwaring is furious at the lack of discipline. Walker is overheard by Godfrey arranging to get some prisoners out of the camp, and they suspect him of being a fifth columnist. He is actually just using them as cheap labour to assemble radio parts. Captain Bailey from GHQ arrives whilst some of the prisoners are out of the camp, and the platoon comes up with a ingenious plan to make it look like none of the prisoners are missing. 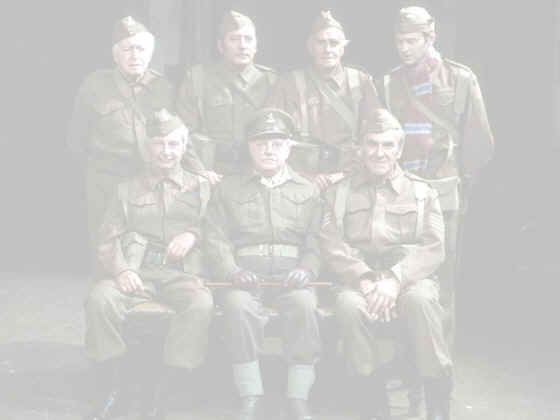 Episode 6 : "Absent Friends"
When Mainwaring gets to the Church Hall he finds that Wilson has given the platoon time out to play the Wardens in a darts match and is furious and orders them back at the church hall in 10 minutes. There is 2 pints riding on the outcome of the darts match, so no-one is prepared to leave the pub, except Godfrey who stands by Captain Mainwaring. There is an IRA suspect reported at 27 Ivy Crescent, and Mainwaring finds himself a little short-handed when he has to deal with it. Episode 7 : "Put That Light Out"
The platoon are to set up an observation post at the lighthouse. Whilst Jones section are on duty they accidentally turn on the light which illuminates the whole of Walmington-On-Sea, just as the siren goes off to warn of approaching enemy bombers. The lighthouse has it's own generator and Mainwaring has to warn Jones, but the phone is out of order. Jones to tries to block the light by holding a sheet over it, but only ends up nearly starting a fire. Walker eventually gets them in contact with Jones and they manage to put the light out just before the planes fly over. Episode 8 : "The Two And A Half Feathers"
George Clarke, a former colleague of Jones in the Sudan, arrives in Walmington and joins the platoon. Before long he tries to say that Jones was a coward and ruin Jones's reputation. The post brings Jones 3 letters, and a stark message that there is no room in Walmington for a coward! Jones relates his side of the story to the platoon, which we see in flashback and his war record remains untarnished. Clark scuttles away to the station in disgrace. Episode 9 : "Mum's Army"
The women of Walmington want to help take part in the war effort. One of these women is Fiona Gray to whom Mainwaring takes a shine to. When the women are on parade hi is always complimenting Fiona on her efforts. When they are both seen in Anns Pantry, tongues start to wag, saying there is more to this relationship than meets the eye. When the women are next on parade, one of them says that Fiona has been seen going to the station. Mainwaring chases after her and begs her to stay, but says she can't. Mainwaring is left broken hearted. Episode 10 : "The Test"
Chief Warden Hodges challenges Mainwaring and the platoon to a cricket match. Mainwaring makes himself captain and tries to teach the platoon, and discovers that Godfrey has shins that chip easily! Hodges tries to cheat by accquiring a cricket pro in his team, Ernie Egan (Played by Freddie Trueman), who signs on as a warden. Mainwaring has an argument with the Verger, who is umpiring, about a no-ball. In the end, Godfrey even surprises himself when he scores the winning runs with a six. Episode 11 : "A. Wilson (Manager)?" Wilson gets promoted to Manager at the East gate branh and also gets his commission, much to Mainwarings annoyance. Mainwaring makes Pike relief Chief Clerk and promotes Jones to Sergeant in the platoon. A memo gets confused and all the platoon think they have been promoted to Sergeant. Sadly, Wilsons dreams are shattered when the Eastgate bank takes a direct hit during a raid and he returns to Walmington and to his previous jobs. Episode 12 : "Uninvited Guests"
When Hodges HQ is bombed the wardens have very little choice but to share the church hall with Captain Mainwaring and the platoon. Mainwaring doesn't like this and complains about it. The Wardens are to leave, but have to stay at the church hall for a week. Mainwaring and Hodges squabble like kids and the church hall nearly gets burnt down! Episode 13 : "Fallen Idol"
Whilst attending a weekend course Mainwaring is persuaded to drink in the officers mess and distance himself from the rest of the platoon, by the stuck up Captain Square. Whilst the platoon are having their free allocation of 2 pints each Mainwaring is with the officers and is plied with spirits and ends up drunk. In the morning he has to try and get back in the platoons good books and does this by saving Jones's life! At the church parade everyone can wear their medals, but it turns out that Mainwaring hasn't got any. Captain Square taunts him about this and about the quality of the platoon. Angry about this, Mainwaring agrees to challenge the Eastgate platoon to initiation tests with the vicar, the verger and Hodges as the judges. Mainwaring is up the tower first to raise the flag but can't find it. Inthe meantime Square has got up the tower and manages to unfurl his flag, but there is a problem. It has the Walmington platoon on it. Walker had craftily supplied Eastgate with the same flag.